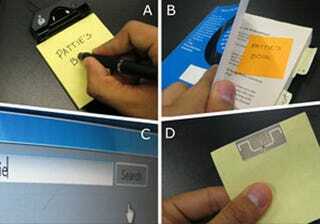 There have been a number of attempts to modernize the much beloved Post-it note, but the "Quickies" concept developed by MITs Ambient Intelligence Group may be the most viable to date. Using RFID technology, AI and ink recognition, Quickies relay written information to our computers and cellphones—making the notes more effective as reminders, and much easier to archive. To get an idea of the possible applications, hit the jump to check out the system in action.